Step 1: First of all we will install Node.js and NPM in our OS. Step 2: Inside the project root folder, we will create package.json and then we will run npm install using command prompt navigating to root directory of the project. It will create node_modules folder parallel to package.json. Step 4: Now we will create systemjs.config.js that will contain mapping for all the packages required. Step 5: Now we will create our demo project. Create a directory such as app in root directory of the project, we will create component, its HTML template, styles, module and main typescript files. We will also create index.html in root directory of the project. Step 6: From the root directory, we will run npm install using command prompt that will download all the required libraries and then run npm start command that will compile all the TS files into JS files and will continue to observe for any change in our files in development mode. To work with angular 2, we need to make sure that Node.js version must be 4.x.x or higher and for NPM it must be 3.x.x or higher. Now follow the below steps. 1. Download latest version of Node.js using the link. 2. 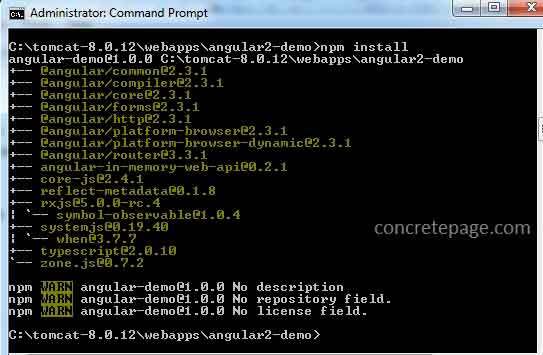 Install Node.js and upgrade npm version by running the command using command prompt as follows. Here 3.10.8 is target npm version. Find the link for the reference. 3. Use the following command to check the node and npm version. node -v : It checks node version. npm -v : It checks npm version. Find the structure of our demo project. To download all the angular 2 dependencies we are using node and npm. Node.js uses package.json file to take user input for angular 2 dependencies. In package.json we configure all angular 2 dependencies. Here we will discuss some important fields of package.json. name and version: These two are the most important fields in package.json. These are the required fields and package will not install in the absence of these fields. name and version together form an identifier and must be unique. Whenever we do any changes in package, we need to change version, too. scripts: It contains commands that run at various times in package life cycle. The key refers to event name and value is command that runs at that point. dependencies : It maps a package name to a version range. Package name can be like myPackage, bootstrap, @angular/common etc. Version range can be like >=version, <version, <=version, ~version, ^version etc. devDependencies : Here we define external test or documentation framework that we use in our module. If someone is using our module, then it is possible that they will not use our development dependencies, so it should be separate from dependencies field. Find the package.json used in our example. We need to put it in our project root folder. When we run npm install, it creates node_modules folder within the root folder of the project. In node_modules folder all the packages and its dependencies configured in package.json are downloaded. Find the print screen for running npm install command using command prompt. Now look at the code snippet in package.json. We can also write the above script as shown below. Here first tsc -w is using alias as tsc:w and then start event is using npm run tsc:w that will ultimately run tsc -w command. target: It specifies ECMAScript target version. Default is es3. module: It specifies module code generation. moduleResolution: It determines how modules get resolved. sourceMap: It generates .map file corresponding to TS file. outDir: It redirects output structure to the given directory. We can use it such as "outDir": "app/compiled-js" . experimentalDecorators: It enables experimental support for ES7 decorators. lib: We need to assign required list of library files in the compilation. The possible values are ES5, ES6, ES2015, ES7, ES2016, ES2017, DOM etc. Now find the tsconfig.json file used in our example. In package.json we have configured start event as follows. Find the links of tsconfig.json references. SystemJS is universal dynamic module loader that loads ES6 modules, AMD, CommonJS and global scripts in the browser and NodeJS. It supports RequireJS-style map, paths, bundles and global shims. Here in our example we are creating SystemJS configuration file as systemjs.config.js that will provide information to a module loader. It helps to find application module and registers all the required packages. Find some SystemJS API used in our example. System.config: This function sets configuration on SystemJS. Here we configure paths, map, packages etc. Find the reference link . System.import: It imports application. We use it as follows in index.html. Now find the SystemJS configuration file, index.html and CSS file used in our example. paths: Here we create alias for paths. In our file we are writing as below. The above line of code means that npm: is the alias for node_modules/ that is the directory for all angular libraries. map: It maps a value into a property. Find the line of code. packages: It defines packages. Find the line of code. When we call System.import('myApp'), it imports main.js from the directory app because it has mapped as myApp: 'app' in mapping block. Here we will understand typings and its use. Angular provides typings itself and we have to do nothing for this step. In angular application development we need to do nothing to get typings. But if we want to create typings separately we can do it. To perform this task we need to provide typings.json file. The packages can be installed from Typings Registry, GitHub, NPM, Bower, HTTP and local files. typings will ensure that they will never conflict in versions. To create typings.json and to use it, find the below steps. 1. Open command prompt and install typings using the following command. Run the above command only if typings has not been already installed. After this installation we will be able to run typings command. 2. We will add core-js, jasmine and node packages in typings.json file as global dependencies. Go to the root folder of the project and run the following command one by one. These commands will create typings.json file and adds the specified packages. Now go to the root folder of the project. We will find a file named as typings.json and a folder named as typings. This folder will contain index.d.ts file for core-js, jasmine and node packages. typings.json file will be created as follows. For the typings command reference, find the link. The syntax of component from Angular doc using TypeScript is as follows. Find the component used in our example. To understand @angular/core mapping with complete path, refer the file systemjs.config.js given in this example. Now find some metadata of @Component decorator. selector : Defines component element. templateUrl : Defines HTML template URL. template : Here we can write inline HTML code. Find the HTML template of AppComponent component. The above CSS has been defined in AppComponent, so this CSS will be applied only in its HTML template that is app.component.html . The syntax of module from Angular doc using TypeScript is as follows. Now find the module used in our example. To create angular module we need to import NgModule, BrowserModule and our components that we have created. All the components must be configured in declarations metadata of @NgModule decorator. The main component which will start other sub component must be configured in bootstrap metadata of @NgModule decorator. The syntax for module bootstrap is as follows. Now find our main TS file. Here we will configure our module that is AppModule . Find index.html used in the example. Now we will conclude here how the angular application will run. 1. When we run npm start command from root directory of the project using command prompt, our typescript files will be compiled in .js and .js.map files inside app folder as follows. 2. Start point is index.html located in root directory. To run application we will access index.html. This page will execute the following script. 3. Then main.js written in systemjs.config.js will be imported. 4. Now the component element <msg-app> in index.html will execute. 5. The <msg-app> component element will be replaced by component HTML template that is app.component.html. 6. In angular project development with TypeScript, we may face two types of errors. a. Compile time error: We face compile time error when we are compiling our project using npm start command. If there is any syntax error in typescript file, we will get compile time error displayed in command prompt. We need to look into error and fix it. b. Runtime error : If project is compiled successfully and when we run the application, then we need to look into browser console for any error. The error could be because of null or undefined values or because of any file path not found. We need to look into error and fix it. Such types of errors are called runtime error.